After a long illness, Professor George Kurt Weissenborn passed away on November 2, 2018 in Guelph, ON. Born on February 14, 1929 in Leipzig, Germany, George was trained as a certified translator before emigrating to Vancouver in 1951, where in 1955 he married Linda (nee Muller). Graduating with a B.A from University of British Columbia in 1967, George accepted a teaching position at Laurentian University in Sudbury that same year. In 1970, he received a Ph.D. from UBC with a thesis on irony in the works of Christoph Martin Wieland, and accepted a position at St. Michael’s College in the University of Toronto. 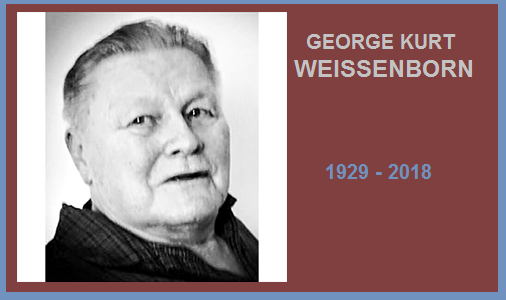 George taught German language and literature at the University of Toronto for 25 years. He retired as an associate professor in 1995, much loved by his students and respected by faculty as a charismatic and provocative lecturer. George moved to Guelph in 1999. Active for decades in the German-Canadian community, he also published on the history of German immigration to Canada.